The modern Cartesian coordinate system in two dimensions (also called a rectangular coordinate system) is commonly defined by two axes, at right angles to each other, forming a plane (an xy-plane). The horizontal axis is labeled x, and the vertical axis is labeled y. In a three-dimensional coordinate system, another axis, normally labeled z, is added, providing a sense of a third dimension of space measurement. The axes are commonly defined as mutually orthogonal to each other (each at a right angle to the other). 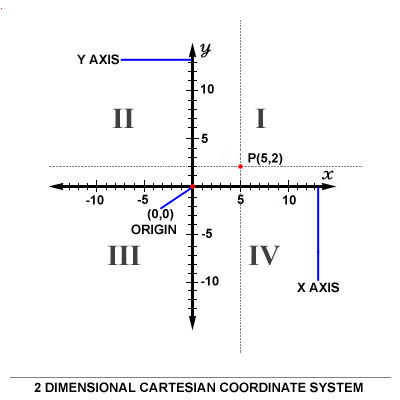 All the points in a Cartesian coordinate system taken together form a so-called Cartesian plane. The point of intersection, where the axes meet, is called the origin normally labeled O. With the origin labeled O, we can name the x-axis Ox and the y-axis Oy. The x and y axes define a plane that can be referred to as the xy-plane. Given each axis, choose a unit length, and mark off each unit along the axis, forming a grid. To specify a particular point on a two dimensional coordinate system, you indicate the x unit first (abscissa), followed by the y unit (ordinate) in the form (x,y), an ordered pair. In three dimensions, a third z unit (applicate) is added, (x,y,z). An example of a point P on the system is indicated in the picture below using the coordinate (5,2). In the two-dimensional Cartesian coordinate system, a point P in the xy-plane is represent by a tuple of two components (x,y). y is the signed distance from the x-axis to the point P.
In the three-dimensional Cartesian coordinate system, a point P in the xyz-space is represent by a tuple of three components (x,y,z). z is the signed distance from the xy-plane to the point P.
The arrows on the axes indicate that they extend forever in the same direction (i.e. infinitely). The intersection of the two x-y axes creates four quadrants indicated by the Roman numerals I, II, III, and IV. Conventionally, the quadrants are labeled counter-clockwise starting from the northeast quadrant. In Quadrant I the values are (x,y), and II:(-x,y), III:(-x,-y) and IV:(x,-y). Generated on 4/25/2019 11:46:35 AM (PST) ADI/HQ/GBA/2019/ARIELCLOUD/v3.0.2018.0126.